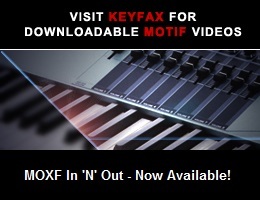 Viewing topic "Exporting Midi File correctly out of Logic into MOXF (Song) for live performance"
I’m the new owner of a MOXF6. I’ve been reading the manuals and sorting through forums. I am having some trouble exporting a midi file out of Logic and I’m hoping this forum can help. I apologize in advance if this has been hashed out elsewhere. My MOXF is connected to my imac via USB. My iMac and Logic (v.10.4.1) see the MOXF. All seems to be good on that front. I have developed a song in logic with about 8 different midi tracks (including a dedicated click track). I have setup the sounds I want to use within Song Mode in the MOXF. Midi channels are assigned. Logic plays the songs just like I want. But exporting the midi file, so that I can load it into the MOXF for live performance, is where I’m having trouble. I have “joined” my individual midi tracks together, selected all of them and then click on “File/Export/All Midi Tracks as Midi File”. I load that onto a USB drive and then plug it into the MOXF. I can load the file into the song that I have setup. But, when I go into Song Mode and play the song (on the MOXF),most of the tracks now simply play a piano sound. One track plays correctly, but it is an octave up from where it was when I played it back directly in Logic. I am very new to midi. I get that it is just data. And that the MOXF contains the instruments sounds. I was assuming that the midi channels that were assigned within Logic would be a part of the midi file that was imported into the MOXF. Also, I assumed that parameters like octave designation would carry over as well (i.e. when played back within Logic, the “C” note would be a low one, but once imported into the MOXF, it is now much higher). I feel like I am close, but I’m just missing something. Do I need to go into the Midi Event menu (in Logic) and make further changes? When you export a standard midi file out of Logic, it doesn’t set anything up for you on any particular keyboard or device as it is, but there are things you can do. 2 - You could also get the Voice and Bank numbers for the sounds you are using from the MOXF data list and draw in Program Change and Bank Select controller data before the first notes on each track using the controller lanes for those controllers at the bottom of Logic’s piano roll editor. Those will remain in place when you export your MIDI file and should recall the voices on the right parts when the midi file is finally loaded into your MOXF. I’d suggest that a mix template is probably the easiest way with the least amount of faffing around, but you’ve got to remember to save it when you have everything playing the way you want. As for octave designation, I’d move the notes to exactly where they should be, using Logic’s piano roll editor, before you export a midi file.